Posted by Teresa Mihelic HelpDesk on Wednesday, November 14th, 2012 at 11:18am. Bringing the cool factor to the Holidays, the city of Dana Point will have the annual Surfing Santa contest - which will be held at Salt Creek Beach this next Saturday November 17th, 2012. A great way to kick off the season, this event raises money to better the lives of children with autism through Surfers Healing ( a non-profit organization that helps children with autism through the benefits of surfing). The competition is put on by the Ritz-Carlton, and coincides with a surfboard auction that runs through Dec. 3, with beautiful and unique surfboards signed by surfer celebrities. The boards are on display right now at the Ritz. 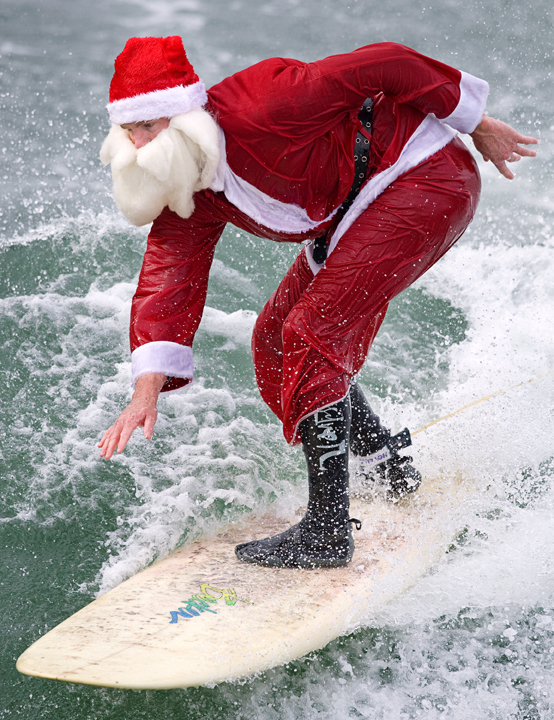 The Surfing Santa contest is a laid back event where competitors dress like Santa or his elves. There are prizes for each category, including a $1,000 prize for the Big Air “Flying Rudolph” category. There’s heats with surfers of various ages, from 15 and under to 20 and older. Entry fee is $50, contest starts at 8 a.m. and even if you don't compete or surf, it is still fun to come and watch see all the 'surfing santas' ride the waves of Salt Creek!